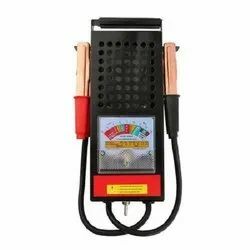 Manufacturer of a wide range of products which include inverter spot welding equipment - tecna 3664 fully automatic, combination spanners, screw spanners and car battery tester. The 3664 models represent a resistance welding system controlled by a microprocessor suitable for car body repair applications. The welders 3664P and 3664P7 are fully automatic. When in the Smart Plus mode, the touch-screen display welding control is able to recognize automatically the type and thickness of the sheets to be welded by relying on sensors placed within the gun. This feature simplifies the operator's work as the software automatically sets specific welding parameters ensuring the best welding quality without needing to rely on particular skills. This system is recommended especially for HSS which will be widely used in future car models. The use is extremely easy by means of a touch-screen display offering the choice of manual, automatic or specific programs of the car manufacturers. By means of a USB flash memory, it is also possible to upload new welding programs or send to a PC the results of the welding process for a further elaboration. 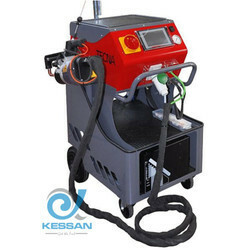 An inverter technology welding gun with built-in transformer matches the system. The combination of these two technologies creates an efficient machine that delivers a power of 14.000A using a 32A fuse only. This low energy consumption represents the solution to the problems of car body repair shops having low mains supply. At the same time, however, this technology ensures the highest quality of welding since the transformer enables to deliver the current needed to ensure a perfect welding as per the prescriptions of car manufactures. The faults are detected and, if possible, they are compensated. If it is not possible to perform a welding process, pieces of information about the quality safety will be displayed. We are profoundly offering a comprehensive assortment of Combination Spanners, which is designed and fabricated by utilizing utmost grade raw material, which result the end product of the finest quality. We also offer the combination spanners at customize option, in accordance with the requirements mentioned by the clients. 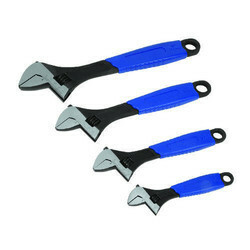 These combination spanners are thoroughly examined against numerous quality parameters to make them quality approved before delivering to client's premises. 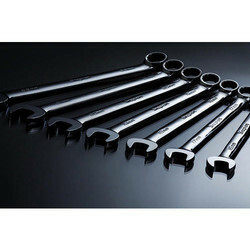 We are offering Screw Spanners to our client.